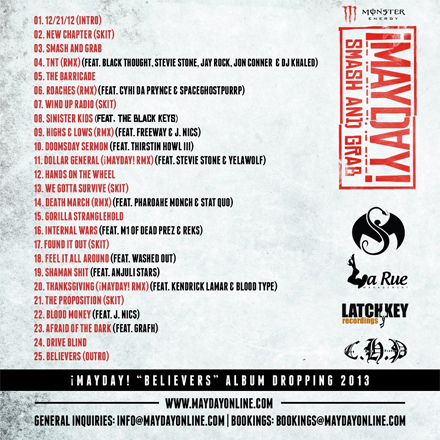 Just in time for the end of the world, ¡MAYDAY!’s latest gift, the Smash And Grab mixtape is out and available for free download! Featuring the likes of Black Thought, The Black Keys, Kendrick Lamar, M1 of Dead Prez and so many more, this mixtape is the perfect accompaniment to these troubled times. The mixtape is mostly a collection of remixes, freestyles, and previously unreleased rarities, so expect a few tracks you may have heard before and a bunch you haven’t. DOWNLOAD THE “SMASH AND GRAB” MIXTAPE BELOW BY ENTERING YOUR EMAIL ADDRESS. What did you think of the new mixtape?